One of our main goals in setting up Gambia Birding Experience was to make it affordable for all birders and photographers. With these prices we sincerely hope to have accomplish that and we would like to invite you with your partner or friends to book one of our experiences to see that it is all possible to enjoy the best of the Gambia on those rates. 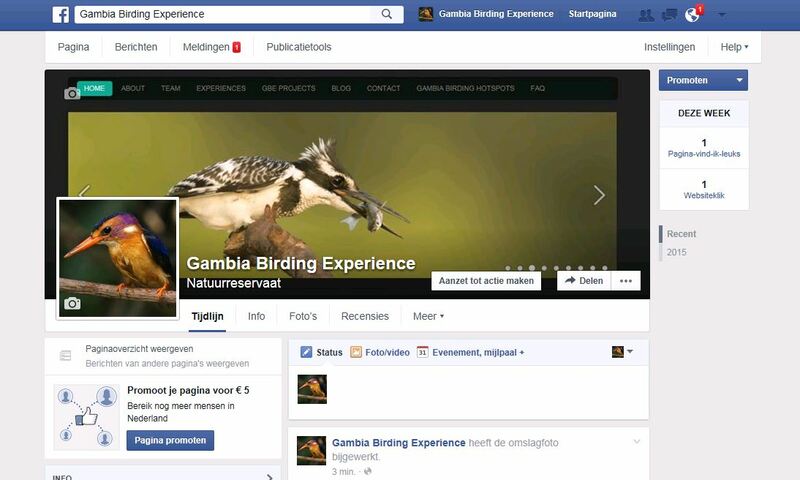 If you are allready in the Gambia on holliday and want to use our guides for one or more days please leave a message on our contact page and we will contact you asap. At the moment only the flights are not included as they are not available from companies like Arke fly and Corendon until May-June 2016. Then we will have the winter rates for the Gambia but they will be around 500 euro's for flights from Amsterdam to Banjul. GBA will also try to get group pricing deals if we have enough people to join the experiences. We will inform all people and when we do so, everyone will enjoy the extra cost deduction. If you like our programs, pricing and service but wants to go on a more bespoke experience that's also possible. Please have a look at the pricing we use here and please assure you see what's include and excluded as there are some differences with the group Birding Experiences. If you fill in the forms and submit we will send you an clear offer to meet your wishes and we will make sure every customer that goes with us will be 100% satisfied. We will pick you up from your hotel and arrange everything from that point on till the moment we have brought you back to the hotel. We can do individuals, couples or small groups.